The Metropolitan Transit Authority of Harris County (METRO) is the region’s largest public transit provider, offering safe, reliable and affordable transportation services about 370,000 times per day. METRO operates more than 1,200 buses, and #SystemReimagining is now underway. For a good picture of where we are headed see our new system map. METRO is currently expanding its 13-mile Red Line with two new lines under construction. Other METRO services include: Star Vanpool, METROLift, HOV lanes, HOT lanes, Bikes-on-Buses/Trains program, Park & Ride, and road improvement projects. Learn more about METRO visit ridemetro.org where you can download our information about our T.R.I.P. app and our interactive rider tool METRO 360 [take a seat]. Construction of new Harrisburg METRORAil overpass construction is now set to begin. The Green (East End) METRORail Line will commemorate the beginning of construction for the new Harrisburg Overpass with a groundbreaking ceremony on Sat., March 14, 2015 at 9 a.m. The observance will take place in the 6200 block of Harrisburg near the METRORail Service & Inspection Facility. The program will include a groundbreaking with dignitaries and community leaders and light refreshments after the ceremony. 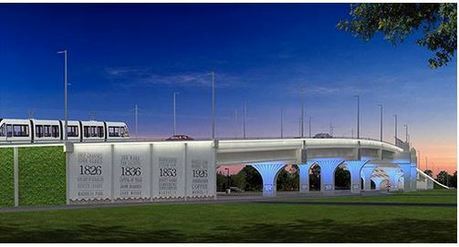 The overpass design is the result of community input and combines the “History of the East End” and a “Garden Wall”, incorporating white LED lighting with blue accents at the bridge columns to enhance the appearance of the lower side of the bridge. METRO's Board of Directors voted on Jan. 29, 2015, to move forward with the Harrisburg Overpass, awarding the contract to McCarthy Building Companies, Inc . The bridge will be built along the Green Line (East End), near the Gus Wortham Golf Course, allowing cars and trains to travel over the Union Pacific East Belt freight rail line running north-south, west of Hughes Street. The half-mile overpass will complete the Green Line which is scheduled to open this spring. EDITORS NOTE: Please call the METRO Press Office at 713-739-4040 to make arrangements for parking. Access to the site will be from Harrisburg Blvd. A tent will be set up at the event and MPD officers will provide security for the event.